MF002 - set of 10 SNOM probes, supplied without tuning forks. Material - single mode optical fiber Nufern 460HP. 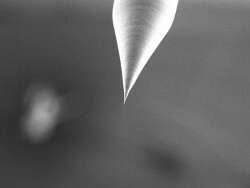 Probe tip is coated by Al (70nm)/sublayer V (20nm) . The probes are prepared by chemical etching method. This method gives the optical efficiency 102 - 104 times better than those obtained by mechanical pulling. Probe tip with Al coating. Aperture is 70 - 130 nm (100±30).